Given over 20 years in the commercial housing market, we have found a certain project type fits our capabilities and those of the factory partners. Focusing on these types of projects creates the highest value to our clients. Client Relationship Type – Design Build. Triumph is a construction manager specializing in modular, we hold the architecture under our contract so our clients have a single point of contact. Size project – Low rise, 3 story maximum (current maximum given MFG capacities) wood frame, over basement, podium, or frost wall with crawl space. Project Case Study : Town of Acton House Authority to design and build a residential community. Here’s a short video showing the elements of this multi-family development. Why would you choose triumph to build your housing development, residence hall, multi -family, rental apartment building ? Most combined experience in New England at permanent modular construction (Click here to see over 16 successful highly custom and complex permanent installations using “off site built” modules ). Repetitive teams using repetitive processes and building plans. Pre-established strong relationships with manufacturers. 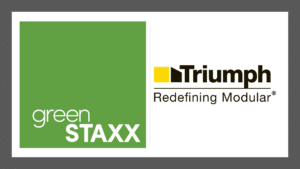 Pre-engineered module designs that make up the guts of the building – Triumph GreenStaxx Housing System. Pre-engaged architects with modular experience. Fixed cost of Professional Services, Design and Engineering. Costs of modular components known quickly. Reliable Guaranteed Max Price in 90 days. Experienced in all major contract forms. Backed, Bonded and Financially strong since 1981. A proprietary process that provides the required controls and guard rails to achieve, limited Change Order Guarantees, and firm schedule commitments. Learn more about our partnership with GreenStaxx. With an extensive library of multi-unit housing designs, the software GreenStaxx has developed streamlines the process of planning and setting an accurate budget for residential modular projects.